We finally got round to doing a few things on our summer bucket list, most we are saving for next week, as the kids are with us for 10 days! 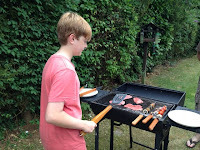 One of the items Hayden wanted on the bucket list was his BBQ night, as he had specifically asked for this, I wanted to make sure we did it and so it was one of the first things I wanted to cross of the list. 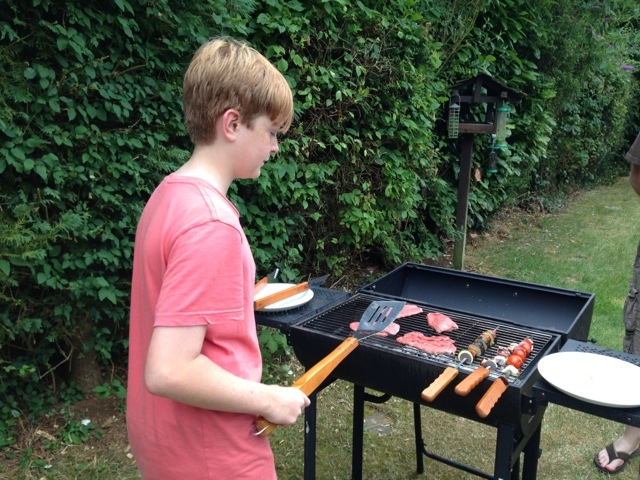 He was very keen to cook the food himself, he set the menu of steak and hotdogs and I added new potatoes and halloumi kebabs. The hubs got the BBQ going for him and H did a great job of cooking the food, making sure it was cooking right through, he even helped his dad clean the BBQ afterwards! Two other things we crossed off the summer bucket list this weekend were, putting up the outdoor clock and installing a bottle opener. We've been looking to get an outdoor clock for quite a while and the hubs mum gave us one as an anniversary gift in June, we've mounted it on the wall of the shed with the clock facing down the garden and the barometer towards the house. When the pond is replaced with the new patio we may move it down onto the garage, but for now it's great where it is. 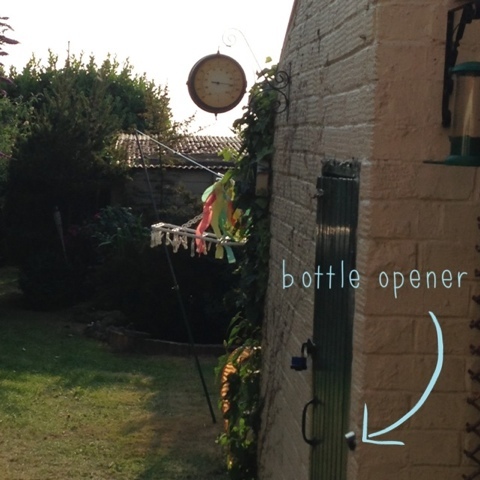 Whenever we have a BBQ or outdoor party the bottle opener always goes missing or gets lost, so we talked about putting up a bottle opener on the shed. I managed to get one from eBay for £3.95, it's very industrial and functional but just what we wanted, the hubs also put this up at the same time as the clock. Again it probably won't stay where it is although I do think I'll get the bottle cap holder that can be fixed below. Nice to cross off some items, we'll be crossing more off soon as we have K & H for a week soon.